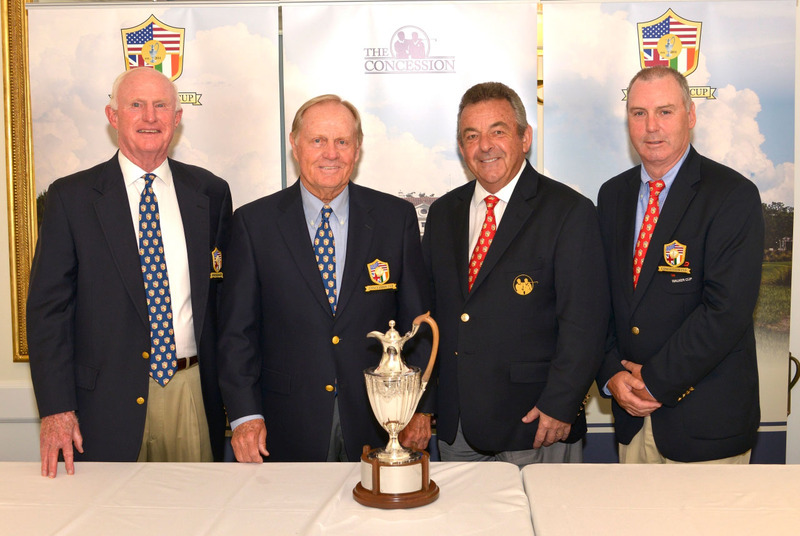 The inaugural Concession Cup, a unique match-play event featuring 18-man teams from the US and Great Britain & Ireland—squads comprised of eight Mid-Amateurs (ages 25-54), eight Senior Amateurs (ages 55 and older), and two Super Seniors (70 and older)—gets underway today at the award-winning Concession Golf Club, a Jack Nicklaus Signature Golf Course designed in association with Tony Jacklin. To see a photo diary from Jack Nicklaus’ visit to the club and event Tuesday, go to http://www.nicklaus.com/features/photo-diaries/. For live scoring and updates, you can visit www.concessioncup.com. US playing captain Vinny Giles is on the left and captain Garth McGimpsey (GB&I) is on the far right. Tony Jacklin is beside Jack. The inspiration for The Concession Golf Club was born 45 years ago when Jack Nicklaus conceded a short putt to Tony Jacklin that produced the first-ever tie in Ryder Cup history. That moment, widely regarded as one of the greatest gestures of sportsmanship in golf and sports, became the idea for Concession Golf Club–a Jack Nicklaus Signature Golf Course designed in association with Tony Jacklin—and host site of this week’s inaugural Concession Cup in Bradenton, Fla. Fittingly, Nicklaus and Jacklin serve as honorary co-captains of the match-play amateur golf event, which gets underway Thursday with 18 amateurs from the United States against 18 from Great Britain and Ireland. The Walker Cup-styled event will feature a unique blend of the top mid-amateurs, senior amateurs and super seniors. At a press conference to kick-off the tournament, Nicklaus recalled the historic moment, which saw a 29-year-old, first time Ryder Cupper in Nicklaus play the anchor singles match against two-time major championship winner Jacklin. Instead of making Jacklin make a 2-foot putt to halve the hole, Nicklaus picked up his opponent’s marker and conceded the putt, which led to the first tie in Ryder Cup history. The Concession Golf Club was unveiled early in 2006, and was later named Best New Course in America for 2006 by Golf Digest. “Tony came up with the idea for The Concession Golf Club,” Nicklaus said. “He called me and said, ‘Jack I have this idea.’ I said ‘You’ve got to be kidding me. You think we can make a golf club out of that?’ Tony did a lot of Ryder Cup stuff here on the property—a lot of things that carry over from the matches. “It’s a wonderful match-play course,” Jacklin added. The course will provide this week’s field with a good test of golf. This week’s playing captains are Vinny Giles (United States) and Garth McGimpsey (GB&I). Giles is a former U.S. Amateur, British Amateur and U.S. Senior Amateur champion with five appearances (one as a captain) in the Walker Cup. McGimpsey won the British Amateur in 1985 and played in three Walker Cups, while captaining two other times. “Other than some chemistry, if Tony’s guys play well and Jack’s guys don’t, Tony’s guys are going to win and vice-versa,” Giles said. The teams will compete in foursomes (alternate shot) on Thursday, followed by four ball (best ball) on Friday, before singles action concludes the inaugural edition Saturday. The public is welcome to attend free of charge, and the tournament has several charities (The First Tee of Tampa Bay and Sarasota/Manatee; Orphan’s Heart Foundation; and the Nicklaus Children’s Health Care Foundation) tied into the amateur competition. Following introductory remarks by all, Nicklaus recalled how integral his time in amateur golf was to his standout career.